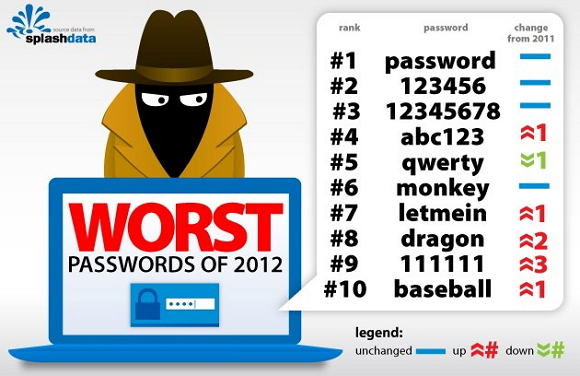 Splash data released top 25 worst passwords of 2012 that means these passwords are the most common password used on the internet and also hackers can easily knows your passwords. In a year with several high profile password hacking incidents at major sites including Yahoo, LinkedIn, eHarmony, and Last.fm, SplashData's list of frequently used passwords shows that many people continue to put themselves at risk by using weak, easily guessable passwords. The top three passwords, "password," "123456," and "12345678," remain unchanged from last year's list. New entries to this year's list include "welcome, " "jesus," "ninja," "mustang, " and "password1." These passwords are very easy to guess, so now if you are using these passwords please change your password to protect your online account. Create strong passwords with numbers and special characters to be safe.